Acceleration. As in rocket sled. This past month or so has been an amazingly varied, intense, and joyful period of Aikido for me. I’ve had a great time, and learned tons. I would not have said a few weeks ago that I was on a plateau. I wasn’t feeling frustrated or stalled out in any way. But in the last few weeks I have felt a sort of acceleration kick in. Zero to 60 is one thing. But when you’ve already been doing 60… Wow. I’m not sure why it’s been like this, but I’m enjoying the heck out of it, and waking up excited about each day. In my experience, as a native San Diegan, this time of year is one of beginnings. It’s blazing hot for months, and then things start to cool off. Rain comes, and the hills start to go from gold to green. I associate the changing light and weather with the start of start of the school year, so it just feels like a time for learning new things. Also, I’ve been writing a lot here (not just the posts you’ve seen, but drafts for future posts, or just private reflections), plus putting my thoughts down on paper after class in a notebook I carry with me in my dojo bag. Writing helps me digest information, see patterns, and remember. I’ve been writing because I’ve been inspired by everything I’m experiencing and learning, but the writing also deepens the experience and solidifies the learning. Actually, this all really started around the beginning of August. Sensei did some really revealing and inspired work with us on embodying qualities in our Aikido. We had several classes that, even though each was only an hour, generated the kinds of insights I might hope for from participating in a seminar. Lots of discovery and realizations. The kind of work that whaps you upside the head and wakes you up. I was in the midst of several personal transitions, discovering where I fit in, and the processes we did on in class helped me see more clearly the real issues underlying some situations I’d been suffering over. Later in August, while on vacation with my husband, Michael, I got to train at Portland Aikikai, in Oregon. They were very nice folks. I hope I have the chance to go back. If you’re in the area, stop in and train (ask first, of course). They are a warm, welcoming group. I participated in three classes, with three different teachers. That was very challenging! Each one had a little different feeling to their class, and everything was a little different from what I’m used to. So I had to stay very awake! Even warm-ups were done a little differently. Training there was really fun, and mentally exhausting, paying attention that closely for that long. Also while on vacation I managed to sneak in an Friday morning class at Michael Friedl Sensei’s dojo in Ashland, Oregon. I’d trained with Friedl Sensei once before, at the Aiki Retreat, and felt right at home. Here again, if you’re in the area, get in touch with him about training. It was a pretty laid-back energy class, which was wonderful, because it was at 7 a.m., and I’m not sure I’d have been up to anything too terribly vigorous at that hour. I’d never trained that early before! At the end of class Friedl Sensei took a moment to explain why they were all (even himself) wearing white belts and no hakama. For a couple of months (if I remember correctly) each year everyone in the dojo wears a white belt. It’s to remind them of Beginner’s Mind, and that we’re all on this path of learning together, even the teacher. I really like that idea, and it fits right into the sense of newness I’ve been feeling about training. On our way south we stopped in Chico, California, where I got to observe a couple of hours of Danzan Ryu Jujitsu classes at Chico Kodenkan (founded in 1939!). Aikido has roots in Jujitsu, but I’d never actually seen it before. So I was very fortunate that this dojo was about 3 blocks from where Michael went to play in a traditional Irish music session, and happened to have classes at the same time. Here I only went to watch, but the teacher (maybe Ken Couch?) was very generous about stepping off the mat to explain their teaching system and history, and to answer my questions. He said next time they’d get me on the mat. That would be fun! I also got to meet their Sensei, Delina Fuchs, a gracious woman who made me feel very welcome. Once more, if you’re in Chico… Well, you know. :-) The class I watched included two senior students who appeared to be training for an upcoming exam, and a few children who were just beginning. A couple of the kids had to go early, leaving one very new boy and the two seniors in the class. The instructor had them do a really creative, fun Sumo kind of exercise in balance breaking that put the little newbie kid on an equal footing with the much more experienced, bigger students. I often find that watching the teaching and class management is as fascinating as seeing the techniques demonstrated, and this fun, effective exercise was a great opportunity for that. After returning from vacation, on Saturday, September 1st we had two shodan exams at our dojo. We’ve averaged about one a year since I started, so two on one day was a big deal. It was great to see two friends who have mentored and encouraged me from day one take that big step. Inspiring. And the next day (Sunday) one of our other shodans celebrated his 75th birthday! The next weekend, September 7th-9th, we had a seminar on Connection, co-taught by Denise Barry Sensei from Kuma Kai Aikido in Sebastopol, and our own Dave Goldberg Sensei. Part of it was at a retreat center in the mountains. We worked on what it means to be connected – to ground, to ourselves, to our partners, to others. We took a long look at how we relate to being connected. What qualities would a connected person have? What’s easy/difficult for us about connecting. I really started to see connection in a broader context. That whole experience is still reverberating for me, and I’m sure will be for a very long time. Back at the dojo I was available to help out in the kids’ classes for the first time! During the past month I’ve been able to assist a few times with both the 5-7 year-olds, and the 8-13 group. I don’t have a lot of experience working with children, and am grateful to be able to see how Sensei interacts with them, and to have my more experienced dojo-mates, Oya and Gilbert, as examples and mentors. He uses a balanced mix of action and stillness, fun and discipline, teaching and participation. It’s been interesting seeing how they learn, and I got to participate in some fun games and exercises, too. The next Saturday, the 22nd, we had kyu exams at the dojo. I got to be uke for a friend testing for 4th kyu. He did a great job on his test, as did the others testing that day. As is traditional, we all went for lunch afterward. The day after exams, Sunday, a big group of us went to Tijuana, Mexico (about 20 miles south of the dojo) with Sensei, who was teaching a seminar, “The Evolution of Flow,” along with Victor Alvarado Sensei of Aikido Tijuana. The trip was an adventure, the seminar was brilliant, and the party afterward was great fun. What a nice bunch of people! And of course the seminar was another path to seeing things with fresh eyes and feeling new energies. 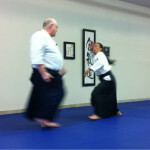 Both at that seminar and in class a few times recently I’ve gotten to take ukemi for Sensei. I love having that chance to feel his technique. It means having to really pay sharp attention and be extra sensitive and responsive. It’s an especially rich experience, and I really enjoy and appreciate having that opportunity. Classes at our dojo are never “the same old thing,” but this past week has been, for me at least, an intensive period of in-depth, precise, technical training. Honestly I don’t know how much that’s what’s being taught, and how much it’s that I’m paying attention more closely. Either way, the whole week has been like opening my head and pouring buckets of information into my brain (and body). I’ve been noticing bigger patterns and relationships between blends and techniques from various attacks. More layers to the onion. I’ve been taking pages and pages of notes after class, trying not to lose any of the precious details I’ve been noticing. This is what inspired my poetic post recently about trying not to drop any of bounty of delicious gifts from a friend’s garden. Wrapping up the month, on Saturday the 29th I took a 3-hour Self Defense for Women class at our local adult education center. I wanted to see what the class covered, how the teacher managed a roomful of newbies, and what kind of concerns the participants brought to the class. I get a lot of people asking me about taking Aikido for “self defense”/personal safety reasons. This is a class I would feel comfortable referring them to, if that’s really what they want. It was interesting seeing how the participants approached training. Some were quite good at picking it up. One didn’t grasp the concept of “pulling” an elbow strike to the solar plexis. (Ooof!) Another woman, in a game of balance-breaking, kept pushing off me when I was solid and she wasn’t, and knocking herself over. And she thought I’d done it to her. Interesting… I wonder where else that happens in her life? It was a fun class, and yet another perspective. What fun! Lots of great classes, five dojos, three seminars, about a dozen teachers, working with kids, taking ukemi, shodan exams, kyu exams, four parties, travel, writing, high falls, technical work, personal process work… And I’m probably forgetting a lot, too! Today I started out with a massage. Now I’m off with Michael to visit a great bookstore, listen to music, and have dinner with friends. 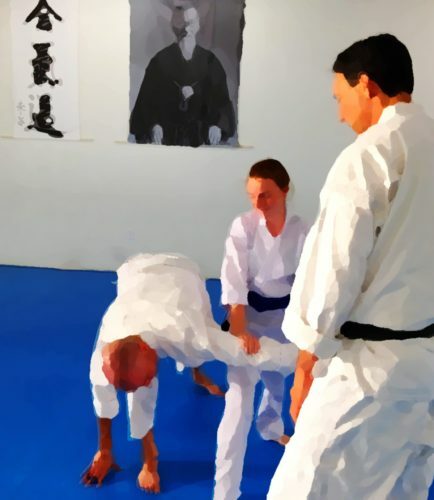 And tomorrow… Another new month of Aikido begins. Yay! The specificity of meaning really struck me. What a beautiful image. “Clarity” alone is OK, but each of us might make up in our mind’s eye something different that it means for us. I might envision a turquoise beach in a cove, where I can see all the way down to the white sand beneath the lapping waves. You might see a perfect crystal bowl, with sparkling facets splitting the sunlight into rainbows on the dining room walls. Saeru: The clarity of the moon on a cold autumn night. It’s easy to picture the outlines of trees against the sky, and sharp shadows on the colorless ground. We can feel the chill in the still air, which smells vaguely of damp earth. Searu. Clarity. In class we are sometimes given an element to explore. Sensei will call out a word: Earth, fire, water, wind, smoke, life, steam… We try to manifest the feeling of the word in our Aikido. It helps us access new energies within ourselves that we may not have realized we possessed, or maybe have been afraid to show. A heavy, deliberate person might find a new lightness through being smoke for a few minutes. One who is quick and forceful might discover that they can flow and relax when embodying the character of water. The meaning of each word is intentionally left open to interpretation. Water can smash to splinters boats left resting at their docks, tumble cheerfully with a invigorating whoosh over rocks in a riverbed, or trickle gently into a pool in a desert canyon, and it can change from one moment to the next. It’s left to each of us to discover water for ourselves. For me, it helps to have a specific, vivid image in mind. When I first started training I really had trouble being compassionate in the way Sensei referred to as “ruthless compassion.” I was unfamiliar and uncomfortable being powerful, clear, and direct. It felt mean-spirited and intrusive. Not nice. Brutal. Rude. It was difficult for me to access ruthless compassion. But then I found an image that really worked for me: A veterinary assistant. Picture a caring, kind, decent person safely but decisively restraining an animal that needs help. Not mean or brutal at all, but clear and direct. Loving, even. And the animal usually feels safer and calmer when handled that way. With that image I was finally able to start exploring the idea of “You, on the ground now, and stay there,” without feeling like a jerk about it. That’s why I love that definition of “saeru”. It conveys enough information that I can see and feel it. When I’ve worked with qualities in my Aikido practice I’ve usually had some vague image in mind, but the words alone elicit nothing in particular. I haven’t been really conscious of the importance of getting a specific picture, but I think it would be helpful for me to do that. I’ll play with this idea more as I train. Not just “fluid”, but fluid like smoke dancing upward from from a stick of incense in still air. Joyful as a Golden Retriever racing after her tennis ball again and again. Grounded like an ancient Oak tree rooted between huge granite boulders. Vivid, specific, and clear. Let it come to you. Relax. Center. Keep your own alignment and things will work out. Like armfuls of fresh vegetables from a friend’s garden. Without dropping any between here and there. A few escape my grasp and roll away. Each is a delicious treasure. 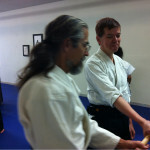 I recently participated in yet another Aikido seminar. In fact, it was the weekend immediately following one at our own dojo. Between the two weekends, as I was leaving after Tuesday night’s class, a friend observed that I do a lot of seminars, and must really enjoy them. She asked me what I get out of them. It’s a good question, and one that has a lot of answers. I find seminars physically and mentally challenging, and that’s fun for me. Training with different instructors, and seeing techniques done in different ways help me get a broader view of the Aikido world. It also helps me see the “normal” way I’m used to doing things with fresh eyes. Sort of like doing everything with your non-dominent hand for a while. I get to hang out with good friends I only see a time or two a year, some of whom I consider to be my mentors, or maybe more like sisters and brothers. We exchange stories, share ukemi pointers on the backyard lawn, and demonstrate techniques on each other, right in the middle of restaurants. We inspire and encourage each other. Training with new people lets me feel some really different energy. It gives me a chance to learn to deal with that, and see things I need to work on. At my home dojo we really focus on committed, on-target, intentful attacks. At this seminar, with George Ledyard Sensei*, we did that too, but some of the training was a lot faster and harder than I’m used to. It was a great opportunity to notice where I get reactive, and also where I hold back and get tentative (and I got called out on it, too, LOL). At first of course holding back in some cases can be appropriate. We were doing unfamiliar kumi-tachi, starting from a kamae that was new to me (gedan hasso), moving quite fast, just making contact with Uke, plus I was using a borrowed bokken, so starting out slowly made sense! 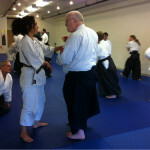 It was an intense (in a good way) exercise, and I was very glad Aikido people are kind and patient. I didn’t even get to any basic level of competence in a couple of hours, of course, but I did start getting the idea (and didn’t hurt anyone). We did a lot of empty-hand training, including combination attacks (two or three strikes in quick succession) on the last day, which were a blast. I went from completely blowing it and getting hit, to at least *noticing* the strikes, and sometimes even responding to them effectively. That was a whole new thing to play with. It was great fun, and helped me be more alert and relaxed. On my way to the seminar and home again on the train, I was trying to take some really challenging photos, with my iPhone. I got ‘em, too! I got I got pelicans flying alongside the train. I got the head of the train going over a trestle near a curve right along the beach, and the whole train rounding a curve in the hills. I got an Atlas V rocket launch! I got deer browsing near the tracks. I got beautiful sunsets and sunrises, farmland and rolling hills. None of them are spectacularly good photos, and I missed many more (like the wild pig galloping alongside the train!). But it’s pretty cool that I could get them at all, using a phone, Trying to anticipate or notice an opportunity, frame the subject and foreground, focus, and shoot, while on a moving train in unfamiliar terrain is very different from the photography I usually do. I was not expecting great results. I shared my photos with friends on Facebook as I went. I am not looking to replace the SLR I normally use, and if I wanted to get really good photos I’d be spending hours on a single subject. It was a fun exercise, though! By changing things up I was able to see in new ways and be more creative without any expectation that I’d capture something brilliant. Sort of a way of reconnecting me with beginner’s mind. That’s kind of how seminars are for me. I’m not looking to replace what I have – not searching for a better way. Just getting a fresh perspective, seeing things in a new light, noticing things I hadn’t noticed before. I always enjoy the challenge, and I’m always happy to come home. And right after I post this I’m going to bed, to get up early on a Sunday and head to Tijuana, Mexico with a group from our dojo. Our own Dave Goldberg Sensei is co-teaching it, along with Victor Alvarado Sensei of Aikido Tijuana Dojo. Another new perspective, another way of seeing things. Looking forward to it! This seminar I traveled to last week was with George Ledyard Sensei of Aikido Eastside, of Bellview, Washington. I’ve admired Ledyard Sensei for as long as I’ve been training. Actually, a little bit longer than that. After I learned of Aikido, but before I ever ventured into a dojo, I wanted to find out if it was really what I was looking for. To that end, I downloaded a series of podcasts – interviews with Aikido people from several lineages. Interviewees included Robert Nadeau Shihan, Paul Linden, Ellis Amdur, and others. Each one’s discription of Aikido resonated with me in a particular way, and helped confirm I was heading in the right direction. One of the interviewees was Ledyard Sensei. He discussed the very things I was interested in at the time, especially with regard to my riding and horsemanship – relaxation in the face of incoming energy, training in a way that supports people in handling progressively more threatening situations without developing tension, and dealing with many levels of fear. He helped me determine that indeed, Aikido was what I was looking for. When I first started training I was completely lost, of course. Because at the time I could only train one evening a week I also spent a lot of time watching videos and reading about Aikido. I found Ledyard Sensei’s DVDs on Entries, and on Aiki, to be very clear and accessible. They helped me grasp and understand what I was seeing in my own training. Sometimes it’s just good to hear things said a few different ways, and Ledyard Sensei’s words about the psychology of perception and about motor learning made a lot of sense to me. A couple of years later I had the privilege of meeting Ledyard Sensei at the Aikido Bridge Friendship Seminar in San Diego. Although I was, I think, just a 5th kyu at the time, he hung out with me at lunch, discussing Aikido politics and history, the joys and challenges of running a dojo, and a dozen other things. I’m very grateful for Ledyard Sensei’s teaching and openness. I finally got a chance to train with him, and am very glad I did. Looking forward to the next opportunity. George Ledyard Sensei, at his Weekend Intensive at Two Rivers Budo, Sacramento. Adam Fong, uke. Studying irimi, including algebra, physics, pick pocketing, black holes, motion receptors, attention, misogi, tomoe, drawing-in, and collusion. There are those who train when they can, and those who train. George Ledyard Sensei Back on the mat for day 3 of the weekend Intensive at Two Rivers Budo. After lunch we’re going to talk about the same stuff, we’re just going to have sticks in our hands. Ledyard Sensei, introducing our upcoming bokken work.